This arc was fun to draw as I’ve been looking forward to adding a new permanent character for awhile, of course a larger cast is more to draw… Oh and poor Nerd’s bear nuts once again! I don’t believe he’ll be entering any breeding programs anytime soon. SPOILER ALERT: Again, if you’re already familiar with our upcoming new character then please refrain from commenting any specifics until the last page of this arc! Today’s vote incentive is a preview panel from later on in this arc: Tanked ruining the fun yet again. Uncle Creepy Face shout out!!! This entry was posted on Friday, July 16th, 2010 at 12:00 am and is filed under BEAR NUTS. You can follow any responses to this entry through the RSS 2.0 feed. You can leave a response, or trackback from your own site. If there’s one thing Evil and Gay have in common, it’s that they always go for the nuts. I always find myself really loving the scenes with all the bears together, waiting on something or planing something or whatever it may be. I love how Gimpy seems so annoyed when Evil hurts someone. Also, Tanked looks so adorable in the panel Nerd does the splits. D’aw, they’re all so cute! Poor Nerd. And I adore Crack chewing on his plate in the second-to-last panel. To be honest I’m very nervous at the prospect of a new main character, as I’m quite happy with the current bunch and (as my family loves to point out) I’m not a huge fan of change. But since you’ve done such a great job with everything in the comic so far I’ll trust that you’ll do a great job with the new guy! @Mickel: I miss Death to! And what happened to his scythe? I haven’t seen it in ages! my favourite bear is tanked, he’s so innocent and, well… tanked. i love the defined characters and personalities that is only created from great writing, i also create comics (sprite comics to be exact) and this comic is part of my inspiration. His glasses where probably ok in this one, but where does Nerd keep getting his glasses? He must have broken a pair almost very episode. btw, how can people get familiar with the upcoming new character? Is he/she ever been drawn before? Re Nerd: ow ow ow ow ow. Gimp’s look of general disdain in the second is great. I don’t get what is going on with the extra dark red lines on Nerd’s logo in the third to last panel. Looking forward to whoever the new bear is. Are there any plans to at some point add all of the bears from the Vice Bears Line up? @Tonka: you’re seeing Nerd’s glasses in front of his logo–they’ve fallen off his face and are hitting the floor. Man, Evil’s pushing eveyrone out of the way…he punts Gay in panel 4. Poor nerd, And tanked always looks adorable! Uh ? Crask eat meat ? Are you sure it’s safe ? Lech already got beaned on the head by Evil!!! Why start with him again!?! Isn’t anyone else surprised that Evil and Crack are sitting next to each other on the couch? Strange. I thought Crack was afraid of eating meat? Great comic as always :) Have to get you on the podcast next year for sure. Is it just me, or does the first shot of Nerd look a bit like David Letterman? It looks like Tanked is the only one concerned about Nerd, who was foolish enough to be the first one to call first dibs when standing next to Evil. My book finally got here! I love it so much; it’s amazing how good the comic looks in print. The bonus story was great (Death FTW!). I kind of wish I had a digital version of the story too since I’ve been getting into making wallpapers again and would like to use some of those panels… Maybe when I get a new scanner. Hey…is there any particular reason that the mystery bear’s head has the same shape as Gay’s head? The shape of the cheeks are the same as Gay’s and the hairstyle is a rounded shape! Oh and I forgot to mention: panel 8 on page 87 = best thing ever. @ Uh What Yeah he does but I think she was going for Jerry Lewis in the Nutty Professor. This the first time I remember seeing his buck teeth in the comic. @budle She said before that the clue can be found in her Deviant Art gallery (which is also where I’ve seen those buck teeth before). The clue doesn’t help id the personality as much as you would think. In the gallery you can she the progression of the characters’ developments. In the description of one of the picture she says Leach is often beaten up by the other bears. The last panel in this week comic would such otherwise. My mistake, Nerd smiles (mostly maniacally) enough in chapter 7 that you see the gap. I just reread a couple of chapters because I noticed several end with cute images of Tanked. Btw in the earlier chapters Tanked has a gap in his teeth, too; probably from repeatedly falling. (No I don’t have a teeth fetish; you just notices odd details when you are sleep deprived). @ Tonka: It’s a small panel but those are his latest pair of broken glasses. Not all the old bears will make it. @ Uh What: ha! Totally not intentional but I see it! @ Yippee Ki…: actually that’s an interesting observation. There’s no relation but they do both have annoying traits, but then which of them doesn’t I suppose. @ forestenchantress: There’s definitely been some changes since their initial designs which had nothing to do with a comic at first. Nerd does have buck teeth but I don’t always remember to draw them. Tank has a chip on the right side which isn’t always visible… or I forget to draw it :P You are very observant. Omg. I love gimp bear! I have a Teddy bear named Miguel and I’m taking him with me to a con and I’m gonna cosplay him as gimp. lemme guess, youre going to add in a girl bear for the guys(you know, everyone?) to fight over? going backwards since the later post but I have two questions. !.whats that red squiggly along nerd in panel 7? and 2.why a hotdog? 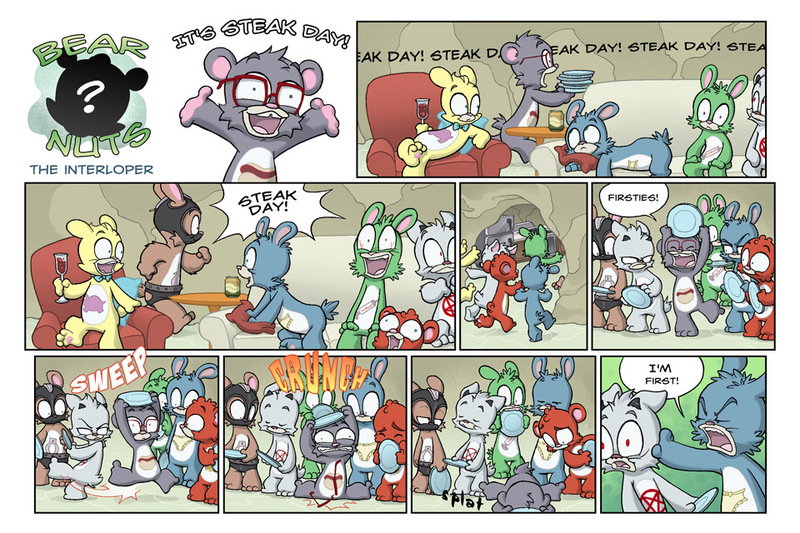 I’ve only just realised nerd bear is saying ‘steak day’ not ‘streak day’ …. Guess lech would be the one screaming the latter, or gay. i love tanked’s face on the third panel!